This work is part of upgrading the gas mains in London with safer and more durable modern pipes. It will affect the roads around Chelsea Academy therefore we invite you to read thoroughly the plan that has been sent to us by National Grid. The work will start on 1st February. King’s Road will be made one way eastbound to ensure the safety of both road users and workers. May to September between Stanley Bridge (railway bridge to the west of Lots Road) and Gunter Grove. At all times access will be maintained for residents and businesses.During the road closures signed diversions will be in place and these are summarised below and shown on the map. February to April – King’s Road will be one way eastbound between Gunter Grove and Edith Grove.This means that westbound traffic will need to go left down Edith Grove and along Cremorne Road torejoin King’s Road at Gunter Grove. May to September – King’s Road will be one way eastbound between Stanley Bridge and Gunter Grove. This means that westbound traffic will need to go up Gunter Grove, along Fulham Road and, down Harwood Road to rejoin King’s Road. You will not be able to access King’s Road along Lots, Road from Cremorne Road. There will also be changes to some bus routes and stops. These are summarised below and information will be displayed at bus stops. Routes 11, 22, 328, N11, N22 and N31 – all existing bus stops will be maintained. Westbound bus stop outside the World’s End Health Centre will not be in use. 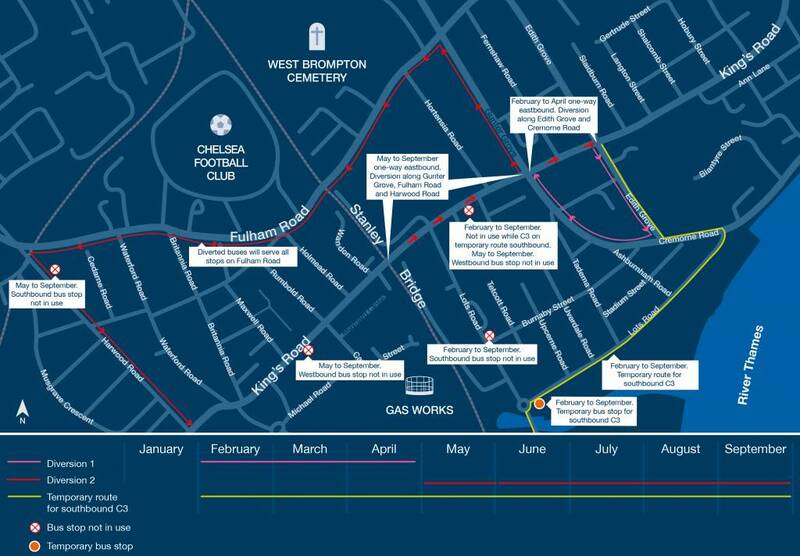 Route 22 will take the diversion up Gunter Grove, along Fulham Road and down Harwood Road. The buses will use the existing stops on Fulham Road. The bus stop on Harwood Road just south of Fulham Road will be suspended to facilitate the diversion route. They will also stop at the bus stop on Gunter Grove which is located at the end of Edith Terrace. Routes 11, N11 and N22 will take the diversion up Gunter Grove, along Fulham Road to Fulham Broadway. They will use the existing bus stops on Fulham Road. They will also stop at the bus stop on Gunter Grove which is located at the end of Edith Terrace. All existing eastbound bus stops will be maintained. The C3 northbound to Earls Court will continue on its usual route and stops. The C3 southbound to Clapham Junction will be diverted along Edith Grove, Cremorne Road and Lots Road to Chelsea Harbour Avenue. This means it will miss the stop on Lots Road at the end of Burnaby Street. A temporary stop will be located opposite the Chelsea Academy on Lots Road. To find out the latest information about the bus routes, please go to www.tfl.gov.uk/bus/status/ or check the Transport for London Bus Alerts Twitter account @TfLBusAlerts.